It's for people who love the unique language and culture found in and around New Orleans. It's a collection of stories, quotes, and memories from typical New Orleanians (as though there's anything typical about us). It's an attempt to document & preserve the language and popular culture. We laughlingly call ourselves "Yatologists". If you would like to join us go to the "The New Orleans Cultcha Forum--Interactive Discussion Board " link at the bottom of this page and tell your story or join the discussion. 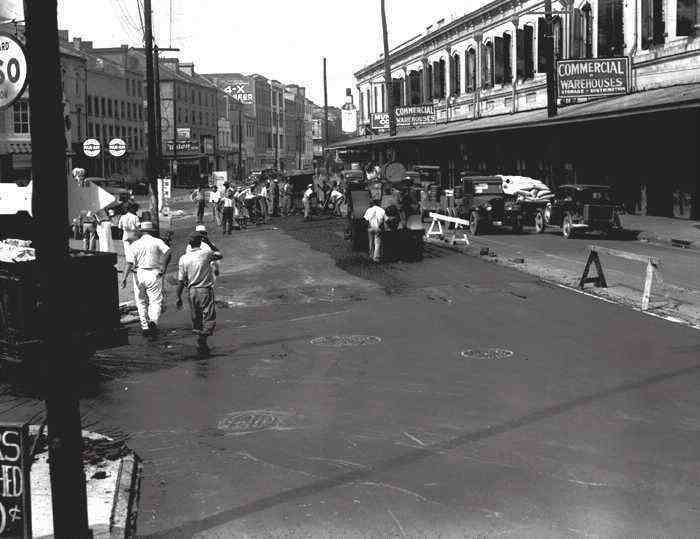 WPA workmen pouring asphalt on North Peters Street near Conti, August 11, 1936. This work started under a separate project prior to consolidation of all street paving under a city-wide project. The area to the left in this photograph is now the site of the recently relocated monument to Jean Baptiste Lemoyne, Sieur de Bienville. The warehouses to the right are now part of the Jackson Brewery complex, housing the Hard Rock Cafe, Tower Records, BookStar, and other stores.